Where does the serratus anterior attach? First of all, it’s important to realize that we talk about attachment sites in the real world, not origins and insertions. This is because sometimes an insertion will move on an origin, and sometimes the origin will move on the insertion. Attachment on scapula: Medial border, with extra concentration of fibers going to the inferior angle. Attachment on rib cage: Lateral outside surface of ribs 1-9. Check out Atlas of Anatomy, 2nd ed. (p. 299) for a very clear animated image and Color Atlas of Anatomy, 7th ed. (p. 207) for a great picture of a real human body. What innervates the serratus anterior? The serratus anterior is the only muscle supplied by the long thoracic nerve. For a basic functional anatomy textbook, I recommend Donald Neumann’s “Kinesiology of the Musculoskeletal System” because it has the best pictures I’ve seen. For an anatomy atlas, I recommend Gilroy’s atlas over Netter’s atlas, though both are good. In school, they pretend like insertion attachments move on origin attachments—never the other way around. So you’re probably familiar with most of the stuff the serratus anterior can do to the scapula. This scapular motion happens when raising the arm overhead. This movement positions the glenoid (shoulder socket) underneath the humeral head (shoulder ball), giving the arm something to rest on. Gravity and whatever weight you may be holding overhead make this upward rotation necessary to get stability in an overhead position. Protraction happens when the arm needs to reach forward. The scapula slide forward and outward along the rib cage. The attachments allow the medial border to come closer to the rib cage. This movement is thought to reduce “scapular winging” and help turn the shoulder socket to face less forward. Another mechanism thought to help reduce “forward shoulders” is a posterior tilt (where the top of the scap comes back and the bottom comes forward). The concentration of the fibers at the inferior angle not only helps with upward rotation, as we talked about, but also this mechanism of posterior tilt. When the arm is overhead (that is, when the scapula is maximally upwardly rotated), the upper fibers of the serratus anterior can assist in downward rotation and lowering of the arm. For a really good picture of this superior part I’m talking about, check out p. 299 in the second edition of Atlas of Anatomy. But there’s oh-so-much-more to this muscle. Since we’ve established that origins can move on insertions and we know the attachment sites of this muscle, let’s get a little creative. This is the same as protraction, except the opposite attachment site is moving. Instead of trying to bring the scapula to the rib cage, this motion is about bringing the rib cage underneath the scap, giving the shoulders something to sit on. When the ribs raise up in the front, we call that rib external rotation. When they come down in the front, we call that rib internal rotation. Put your hands on your lower rib cage. Inhale as much as you can. Notice your ribs coming up. That’s rib external rotation. Now exhale as much as you can (like you’re blowing out a hundred candle birthday cake) and feel your rib cage move down. That’s rib internal rotation. So the ribs have joints in the back (with the spine) and in the front (with the sternum). Depending on the line of pull, the serratus anterior can either internally or externally rotate a rib. With the way the muscle is fanned, the upper part of the serratus anterior can internally rotate the upper ribs (pulls them down). Conversely, the lower part externally rotates the lower ribs. To appreciate this, you need to know how the ribs can direct spine movement. In the back, the rib articulates with the spine twice: onces on the transverse process (costotransverse joint) and once at the body of the vertebra (costocentral joint). The lower, floating ribs have their rib head connecting to one vertebral body. The upper ribs articulate with two vertebral bodies. See picture below. Understanding the sagittal plane is easy: When the thoracic spine flexes, the ribs internally rotate, and when the thoracic spine extends, the ribs externally rotate. Frontal plane: when you sidebend to the right, the right ribs come together and the left ribs come apart. During this, the spine rotates to the left (away from your sidebend). So now let’s put together these rib kinematics with our cool serratus anterior. Since the superior part can internally rotate the upper ribs, it can rotate the upper thoracic spine contralaterally. And the inferior part of serratus anterior can externally rotate the lower ribs, rotating the spine ipsilaterally. Side note: if you put together this lower rib ER with the lower rib IR you get from the left abs, then you’ve got yourself a much more stable left side. AND you’re going to push the lower rib cage backwards, further assisting that rib cage retraction we talked about previously. If that last section didn’t fascinate you (that stuff still blows my mind), then get ready for this. Think of the serratus anterior as a sling in your armpit. When the right sling gets really long, it catches the rib cage as it shifts to the right and this slingrratus anterior makes a big C shape. If I want to push my thorax back over the to left, I want to shorten this sling to make it less of a C shape and more of an I shape. So I contract the right serratus anterior and it shifts my thorax over to the left side. Let’s call this “left thoracic abduction”. A few months back, I was working with this client who had a really pronounced shift of her thorax over to the right. I laid her down, but couldn’t, for the life of me, get this to go away. “Well this isn’t working,” I thought, “Let’s stand her up.” I told her to pretend like she was walking, putting her left foot forward and reaching forward with her right arm. As she reached forward with her right arm, her thorax magically shifted over to the left. I’m kidding. It wasn’t magic. I was physics. With this right reach, the right shoulder blade protracts. But there are other muscles that attach to the scap. The big player I want to talk about is the trapezius muscle, which attaches to the spinous processes of the lowest thoracic vertebra (T12) all the way up to the back of the head. The middle and lower fibers of the trapezius attach to the spine of the scapula and the acromion process. The upper fibers attach more anteriorly on the clavicle. When the shoulder blade protracts, it pulls the trapezius long. This tension pulls on the spinous processes of the thoracic spine, causing the vertebrae to turn to the left. So protraction via serratus anterior also can produce contralateral rotation of the thoracic spine if these spinal segments aren’t immobilized (by other muscles or non-neutral positions). The serratus anterior is the prime mover for upward rotation of the scapula (Ludewig and Borstad, 2011). Upward rotation is required for full arm mobility when reaching overhead. The goal here, and the reason why you care about the serratus anterior, is because you want to help people. There’s a ton of stuff in this field to sift through. If you try to learn a little trick for each problem, you will fail to make progress in the long term. If you, however, learn your anatomy and some basic concepts, you can then use your mind and create new solutions that are personalized for each client. I don’t mean to make this seem easy, but I firmly believe it is more effective. You can never know too much anatomy. What are some ways you can apply your knowledge of anatomy to help people? Problems are person-dependent, but here are some ideas to get your brain wheels turning. Push ups are fantastic for getting a rib cage back underneath a scapula. Imagine reaching your arms through the ground to cue the serratus anterior at the top of your push ups. You can even use this exercise as a way to shut off your back muscles. 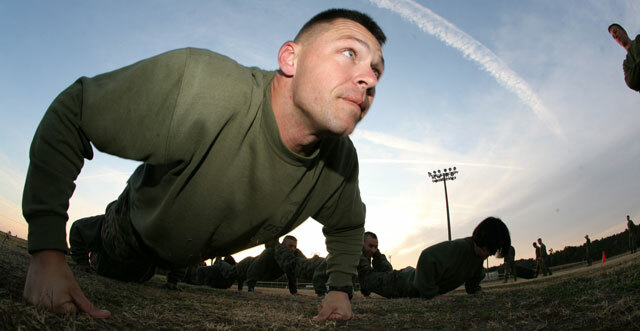 If doing push ups from the floor is too challenging, try elevating your hands in a rack or on a bench of some sort. If you want to incorporate more frontal and transverse plane stability challenges, lifting up one arm at the top of a push up is a great exercise. This exercise is the definition of a whole body lift. Reach your hand “through” the weight during this movement to really cue that serratus anterior. Side note: I don’t usually program the full Turkish get up. Most of my clients will get some form of the partial get up. This partial get up is a great way to learn the first step of the whole Turkish get up. This adds a little more complexity and is great for the shoulders. This variation loads BOTH serratus anterior muscles, but can be difficult if you use it as a starting point. Almost every one of my new clients gets this exercise in their first month of programming because it is useful for learning to stabilize at the hips and the shoulders while engaging the core muscles. I hope this article has given you some new ways to think about and apply your anatomy knowledge to your clients. I love to teach, so please feel free to forward this to any of your co-workers if you think they would be interested in reading. If you have any questions, I’d love to hear them!